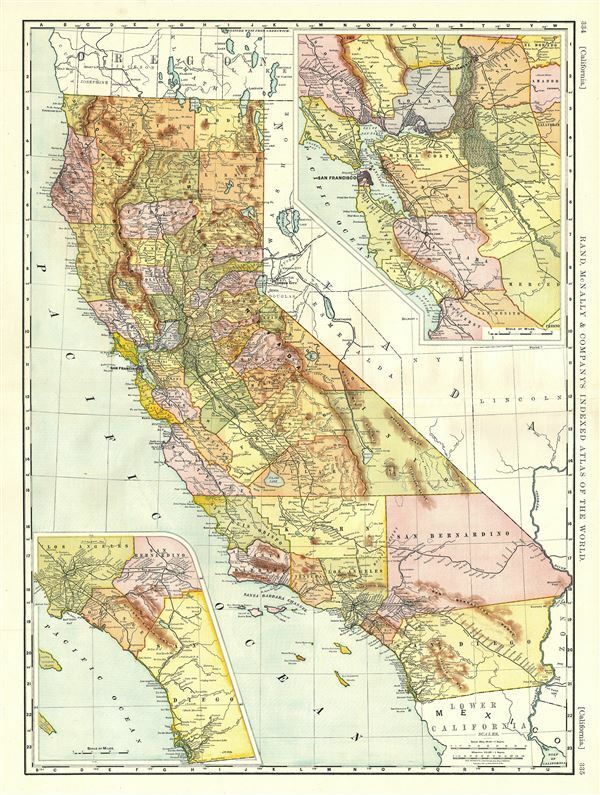 An attractive 1892 map of California by Rand McNally and Company. It covers the entire state of California in extraordinary detail, noting major towns, cities, mountains, rivers, lakes and other topographical features. An inset map of San Francisco and vicinity is included in the upper right quadrant, while another inset in the lower left quadrant details Los Angeles and vicinity. The map is color coded according to counties. This map was issued as plate nos. 334 and 335 in the 1893 edition of Rand McNally and Company's Indexed Atlas of the World- possibly the finest atlas Rand McNally ever issued. Rumsey 3565.146 (1897 edition). Philips (atlases) 1026 (1898 edition).